Nehemiah itself had a long history of composition from many sources, stretching from the early 4th century down to the Hellenistic period. Ezra 10:24–Nehemiah 1:9a. The break between the books is designated by a single blank line. 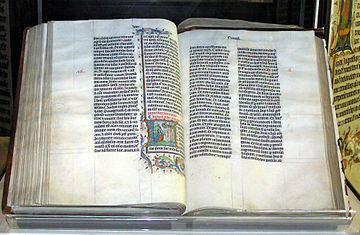 Nehemiah 8); (3) and the story of Nehemiah, interrupted by a collection of miscellaneous lists and part of the story of Ezra. Zerubbabel and Joshua the high priest. 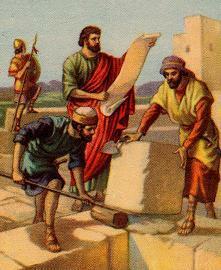 There they overcome the opposition of their enemies to rebuild the altar and lay the foundations of the Temple. The Samaritans, who are their enemies, force work to be suspended, but in the reign of Darius the decree of Cyrus is rediscovered, the Temple is completed, and the people celebrate the feast of Passover. Ezra leads a large body of exiles back to the holy city, where he discovers that Jewish men have been marrying non-Jewish women. He tears his garments in despair and confesses the sins of Israel before God, then braves the opposition of some of his own countrymen to purify the community by dissolving the sinful marriages. Nehemiah, cup-bearer to king Artaxerxes, is informed that Jerusalem remains without walls. He prays to God, recalling the sins of Israel and God's promise of restoration in the land. Artaxerxes commissions him to return to Jerusalem as governor, where he defies the opposition of Judah's enemies on all sides — Samaritans, Ammonites, Arabs and Philistines — to rebuild the walls. He enforces the cancellation of debts among the Jews, and rules with justice and righteousness. Zerubbabel is discovered. Ezra reads the law of Moses to the people and the people celebrate the Feast of Tabernacles for seven days; on the eighth they assemble in sackcloth and penitence to recall the past sins which led to the destruction of Jerusalem and the enslavement of the Jews, and enter into a covenant to keep the law and separate themselves from all other peoples. Nehemiah takes measures to repopulate the city and returns to Susa after 12 years in Jerusalem. After some time in Susa he returns, only to find that the people have broken the covenant. He enforces the covenant and prays to God for his favour. Historical background In the early 6th century Judah rebelled against Babylon and was destroyed (586 BC). The royal court and the priests, prophets and scribes were taken into captivity in Babylon. There the exiles blamed their fate on disobedience to God and looked forward to a future when a penitent and purified people would be allowed return to Jerusalem and rebuild the Temple. (These ideas are expressed in the prophets Jeremiah (although he was not exiled to Babylon), Isaiah, and, especially, Ezekiel). The same period saw the rapid rise of Persia, previously an unimportant kingdom in present-day southern Iran, and in 539 BC Cyrus the Great, the Persian ruler, conquered Babylon. Cyrus (550–530) Fall of Babylon, 539 Edict of Cyrus: directive to the Jews to rebuild the Temple; first return of exiles to Jerusalem, 538; altar restored and foundations of Temple laid. 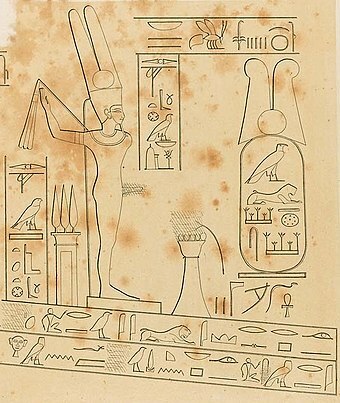 Cambyses (530–522) Conquest of Egypt, 525 Work on the Temple halted due to the plots of the Samaritans. Darius I (522–486) Secures the throne in 520/519 after fighting off various rivals Edict of Cyrus rediscovered: Temple rebuilt, sixth year of Darius (515). 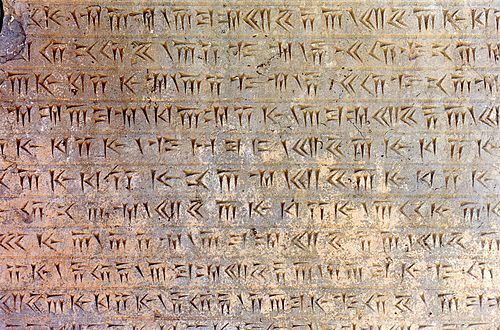 In the book of Daniel, Darius has the old title of Darius I (king of the Chaldeans = Babylonians), while Koresh has the new one of Xerxes (king of the Persians). Xerxes (486–465) Failed attempt to conquer Greece, beginning of struggle with Greeks for control of the eastern Mediterranean (Alternative) directive by Koresh to the Jews to rebuild the Temple; first return of exiles to Jerusalem, altar restored and foundations of Temple laid. Ezra in the "seventh year of Artaxerxes"; second return of the exiles to Jerusalem (458 if the king is Artaxerxes I, or 428 if the year is read as his thirty-seventh instead of his seventh). (Alternative) work on the Temple halted due to the plots of the Samaritans; mission of Nehemiah, 445–433. (Alternative) edict to rebuild the Temple rediscovered: Temple rebuilt, sixth year of Darius. 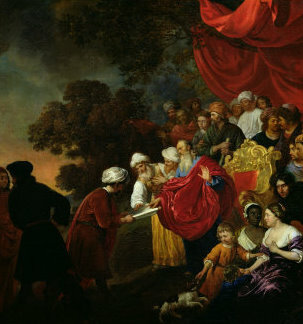 Ahasuerus in the book of Esther (Esther 1:1/10:1-2). Zerubbabel he seems to know nothing about the 5,000 or so who accompanied Ezra.